There're so many ways to celebrate your 21st b-day, from curling up with a good book, to relaxing and playing games with friends, to near-unconsciously filling your arm with tally marks...of how many Scattergories victories you've amassed! 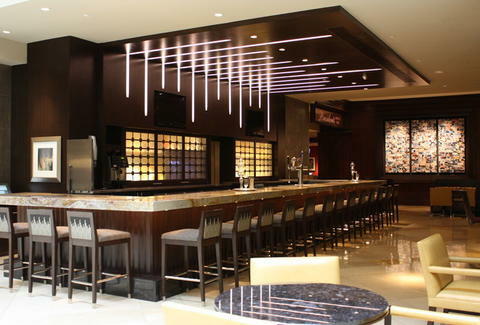 For a shiny new bar built to celebrate a 21st, check out Mixx. Quietly opened as part of the Renaissance Washington, DC Downtown's $5 million lobby redesign/21st b-day gift to itself, Mixx boasts a sleek, polished stone bar bookended with modern, grey-striped booths and backed by sliding translucent doors which create a fittingly blurry image of the bottles behind them. Dranking's covered by a 30+ wine list (many available as 3, 6, or 9oz pours), 13 brews including standouts like Chimay Blue and Hook & Ladder Golden Ale, and creative takes on classic cocktails (next to their traditional counterparts), like a Manhattan loaded up with sweet, cherry-infused Red Stag liqueur and bourbon, the "Century Smash" (a Sazerac with mint/pineapple twist), and a classic Caipirinha with acai liquor/lime called the "Brazilian Cure", which is mainly know for its popular song "Sexta-Feira I'm in Love". They've also got a full lunch/dinner menu, with "share" plates like crispy fried calamari in roasted tomato sauce, "beginnings" like lump crab chowder and Angus beef sliders, and mains like housemade chorizo w/ orecchiette pasta & smoked gouda, and a braised beef shortrib w/ fried onions and root vegetable succotash, whose sufferin' was an acceptable necessity to please your palate. Though Mixx's the main attraction, the rest of the massive new lobby's divid'd up into separate sections, like the center "Mingle" couch area decorated with cherry blossom-inspired diamonds, and "Explore": a 24-arm Murano glass chandelier-accented reading-nook designed to look like a library -- the same place you totally forgot your card and had to go back all embarrassed the next day...oh, 21!